Platte Fifteen, a 5-story 150,000-sf mixed‐use development breaks ground. Demolition of the now‐vacant building on the northeast corner of Platte and 15th Street began this week. The property was formerly home to Natural Grocers and Confluence Kayaks and represents the future site of the aptly named Platte Fifteen, a 5-story 150,000-sf mixed‐use development. 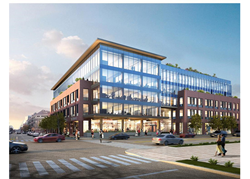 Developed by Fort Worth‐based Crescent Real Estate and designed by OZ Architecture, Platte Fifteen will include approximately 16,000 sf of ground level retail/restaurant space and four floors of office space totaling approximately 136,000 sf above two levels of underground parking. A first of its kind for Denver, Platte Fifteen’s use of highly engineered cross‐laminated timber (CLT) panels will combine the unique characteristics found in historic brick and timber buildings with the added strength of a traditional steel or concrete structure, while reducing environmental waste and improving energy efficiency through use of a more sustainable renewable material. Platte Fifteen is part one of a three‐part development for Crescent Real Estate near the Platte and 15th Street intersection. This first phase is scheduled to open in Fall of 2019. Rendering Courtesy of OZ Architecture.